April 16, 2019 April 16, 2019 by Vinay Leo R.
In a land of diversity, the word sacred might mean different things for different people. And with time, that concept of sacred seems to be changing as well. What allured me to this title was that tagline “In search of the sacred in Modern India.” I had seen this title before, and the earlier cover art was interesting too. I was delighted to get this book as a birthday gift. As evident from the title, the book comprises of nine tales. 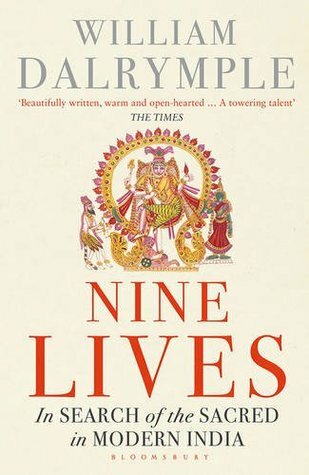 about the lives of nine different Indians. Dalrymple traverses the length and breadth of the country to find stories that reflect the diversity of the nation… a Jain nun, a dalit from Kerala, a Buddhist monk, a devadasi, hereditary singers in Rajasthan, a maker of idols etc. I had known of some of the stories earlier. Having read a book about the devadasi system, the story The Daughter of Yellamma felt familiar. I didn’t know about the theyyam custom in Kerala, but had seen theyyam a few times on television. The book added to what I knew already and what I didn’t know as well. I came to know of the Jain’s ritual fast to the death called Sallekhana, of Baul tradition and of The Epic of Bapuji and a part of its history. The beauty of the book is also in Dalrymple’s narration. He weaves emotion with tradition, at times with irony. There is honesty in the narration too. The stories might seem unbelievable, but the way the author chronicles it, you can’t help but know it is true. Dalrymple also puts it as it is, and there’s a sense that change in these notions of faith, of the idea of “sacred” will not be the same in the future, be it positively or otherwise. This is not a genre I usually read, but I liked what I read. As I was reading it for a challenge, I might have rushed through it. I think a more leisurely read might make this book even more enjoyable.